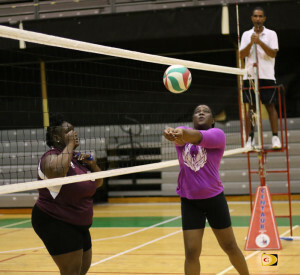 Phoenix Ballers showed some fight in the BVI Volleyball Association Power League over the weekend and was finally rewarded with their first victory of the season at the Multipurpose Sports Complex. However, they really had to work for it. On Friday, Lohanny Santanna almost doubled her digs with a season’s best 59 to lead all six School Them starters in double figures and fended off Phoenix Ballers from getting their first victory despite Marcha Stout and Michelle Merry combining for 85 digs, during a thrilling see saw five set 27-25, 18-25, 22-25, 25-18 and 21-19 triumph. Elecia Todman of School Them, followed up with 21 digs. Mary Fahie and Kjanna Callwood dropped in 15 each, Coleen Edwards 14 and Tygenica George 12 with nine kills. Stoutt led Phoenix Ballers with 48 and Merry added 37 and her daughter Rhekaayia tossed in 19 and Shavique Barzey 11. Then on Sunday, led by Stoutt’s 37 digs along with 33 from Michelle Merry and 26 from Lakeisha Scatliffe, Phoenix Ballers bounced back with their first victory, a 25-18, 25-23, 24-26 and 25-22 triumph over Black Ops. Kinesha Bryan topped Black Ops with 41 digs. Soraya Durante added 33, Kiah Walters had 30, Reyonne Frett, 25 and Trechia Laroque, 24. In the Men’s Division, with the playoffs coming into focus and a crucial March 25 show down with Gunz For Life, defending champions Dream Team got revenge on Raw Power with a four set victory on Saturday night. Dream team rode Canice Marquis’ 21 kills, 14 digs seven blocks and two aces game along with Miguel Martain’s 15 digs, 12 kills, five blocks and two aces in turning back Raw Power, 25-23, 25-19, 14-25 and 25-13. Raw Power’s setter Craig Glasgow who served up six aces to go with two digs and three kills, said it was an ‘off night’ for his team. According to Glasgow, when they meet again, his team has to reduce their unforced errors. “That’s what happened, we made a lot of them on our side,” he noted. Edward Pullock and Clyde Potter had 10 digs a piece and seven and six kills respectively for Raw Power. Gunz For Life rebounded from their two losses with a straight set 25-11, 25-17 and 25-9 victory over Game On. Neville Brathwaite had 10 kills and four blocks for Gunz for Life. Kennedy Bass led Game On with nine kills. The Virgin Gorda Hawks and Go Hard double forfeited.